Choose ONE of the following questions, and write a well-organized, mechanically sound essay in response. 1. In “Symptoms,” Judith Williamson writes that “the tension between plot and image is what gives film an enormous capacity for containing contradictions” (28). Explain what she means by this, and demonstrate how it informs her argument in either one of the essays dealing with Top Gun or Fatal Attraction. 2. In “Symptoms,” Judith Williamson writes that “genre is a means through which an audience brings knowledge to a film: thrillers, westerns, horror films, comedies, etc., provide frameworks in which the audience’s capacity to recognize certain stock elements of plot, theme and image creates the potential for great subtlety of meaning where these conventions may be stretched, played with or subverted” (29). Explain what she means by this, and demonstrate how it informs her argument in either one of the essays dealing with Top Gun or Fatal Attraction. 3. In “Symptoms,” Judith Williamson writes that “anyone interested in the fantasies and fears of our culture should pay close attention to successful films, for their success means precisely that they have touched on the fantasies and fears of a great many people” (27). Explain what she means by this, and demonstrate how it informs her argument in either one of the essays dealing with Top Gun or Fatal Attraction. 4. In “Symptoms,” Judith Williamson writes that “we have to take seriously the complexities of film language and not assume that things we don’t like or understand don’t make sense” (30). Explain why this is important, and how this mission fulfilled by one of her essays dealing with either Top Gun or Fatal Attraction. You have until 10:00 AM. You may leave as soon as you are finished. A reminder: if you have not turned in all three essays, a midterm, and this final by 5:00 PM today, you will fail this course. Thanks, and enjoy your summer. So I can find this if for some reason I ever need to. In the dedicatory epistle to the Duchess of York that prefaces The State of Innocence, Dryden provides a remarkable exposition of the divine power of beauty. He begins the epistle by reducing the poet's active imagination to "a desire of Pleasing" those who can forward his fame, who can be divided into "the Beautiful and the Great." Of poets he claims that "Beauty is their Deity to which they sacrifice, and Greatness is their Guardian-Angel which protects them" (81). Naturally, the Duchess of York embodies both, but in the epistle Dryden is primarily concerned with her beauty, which he claims is even rarer than Greatness. Her beauty, in its purity and perfection, resolves "the differing Judgements of Mankind" and renders language essentially useless (82). "Our sight is so intent on the Object of its Admiration, that our Tongues have not leisure even to praise you: for Language seems to low a thing to express your Excellence...." (83). Her beauty also has the power to transcend the power of the law. "You have subverted (may I dare to accuse you of it) even our Fundamental Laws; and Reign absolute over the hearts of a stubborn and Free-born people tenacious almost to madness of their Liberty" (83). Her husband, the incipient king, will have his divinely derived power augmented; for, as Dryden writes, God "has plac'd You so near a Crown, that You add a Lustre to it by Your Beauty" (82). But her beauty is not merely an adjunct to a King's divine right. Her beauty, when cast upon an unsuspecting soul, "strikes an impression of awful reverence," the "rapture which Anchorites find in Prayer," and thus transforms "Admiration into Religion" (83-4). Indeed, this kind of beauty is a "Deity," that not only inspires, but demands "sacrifice." It seems strange that poets should be confined to finding their inspiration in a Beauty that renders rhetoric and moral suasion impossible. If beauty such as that of the Duchess is beyond debate, and inspires a religious duty that supplants even the law, then what has a poet to say about such beauty? But just as God's omnipotence certainly does not stifle preachers from endlessly delineating His power, beauty's limitless power need not silence the poet. Instead, by thus exalting beauty, Dryden makes prophets out of poets, who are uniquely empowered to give voice to the awe and servile reverence such beauty inspires universally. So the poet has a motive to make of beauty an irresistible force, a divine restorative power, as Dryden admits in the dedicatory epistle's first sentence. "Ambition is so far from being a Vice in Poets," he confesses, "that 'tis almost impossible for them to succeed without it." But what initially seems a servile and sycophantic reduction of the poet becomes finally an exaltation, by which the poet becomes the vessel for the otherwise inexpressible power of beauty. Panegyric prostration and obsequious humility only attempt to mask what seems an apparent grab for personal power. In the Prologue to the Duchess on her Return from Scotland, and later, in the ode To Her Grace the Duchess of Ormond, we see the sort of poetry that is derived from such a motive. The Prologue to the Duchess translates the investment of beauty with political power seen in the dedicatory epistle into verse. The first eleven lines elucidate the consequences of the Duchess's departure. In her absence "The Muses droop'd with their forsaken arts,/ And the sad cupids broke their useless darts" (ll. 3-4). Apparently she carries with her a portable paradise, for when she leaves England's "fruitful plains to wilds and deserts turn'd,/ Like Eden's face when banish'd man it mourn'd" (ll. 5-6). This mirrors the dedicatory epistle, where Dryden tells the Duchess, "your Person is a Paradice, and your Soul a Cherubin within to guard it" (84). Her beauty seems to simply embody the prerequisites for paradise, and her return to England then would appropriately signify the return of a Golden Age. And Nature has for her delay'd the spring. But a conundrum lies in her very departure. Her departure had been forced by "factious rage," the disloyalty and ingratitude of which had toppled Love's "awful throne" (ll. 1, 8). We must then unpack the ambiguous syntax of the following line, "Love cou'd no longer after beauty stay," accordingly. In the wake of the disloyalty inherent in the Exclusion crisis, love is so undermined that it can no longer be attendant to beauty. Love is inspired by the beauty of the Duchess, yet love is impossible without loyalty despite that beauty. The matter is further complicated but the later assertion that "Far from her sight flew faction, strife, and pride" (l. 18). The poet's eagerness to symbolically empower her beauty is belied by the history that occasions the poem. If her beauty was insufficient to prevent "factious rage," then how can its return alone be enough to restore love, and assure that "Distempered zeal, sedition, canker'd hate,/ No more shall vex the Church and tear the State" (ll. 39-40)? The answer to this question may be in the role of the panegyrical poet, who empowers such beauty through expression, who enumerates those "awful charms" that "on her fair forehead sit,/ Dispensing what she never will admit" (ll. 35-36). Her beauty is notably and naturally a passive force, an inspiration, a latency. Even the Duchess's mind, in the dedicatory epistle, is regarded as "Ornament," as an "object of Wonder" (85). The power dormant in her beauty depends ultimately on those who perceive it. Most are incapable of activating it. "Thus, MADAM," Dryden writes in the epistle, "in the midst of Crouds you reign in Solitude; and are ador'd with the deepest Veneration, that of Silence" (83). When in the presence of her awesome beauty, the crowd "are speechless for the time that it continues, and prostrate and dead when it departs." In the poem, her beauty is described as "Pleasing, yet cold, like Cynthia's silver beam" (l. 37). In and of itself, her beauty is remote, and diffuse in its effect. It is the "people's wonder," but more importantly, it is the "poet's theme" (l. 38). It is the labor of the poet to translate her beauty's latent power into the harmonious "Discord like that of music's various parts" (l. 43). In this way the mere flattery of the panegyrical poet is transformed into a more general power. For the audience for such poetry as this is not necessarily the Duchess herself but her future subjects. 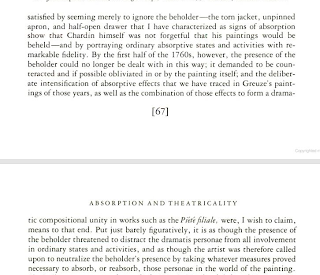 As James D. Garrison points out, "during the Exclusion crisis in particular, Dryden considers the theater audience as the representatives of the whole English nation" (144). Dryden longs to be able to articulate the effects of the beauty of the Duchess on themselves individually and collectively. Harnessing that power as his own, may focus it towards his own end, and use her beauty to exemplify ends and virtues of his own choosing. From notes I took in 1999, when I was researching the early history of advertising in England and its relationship to the development of a commercial fiction industry. The key link is something Turner quotes from a 1970 Atlantic article in regard to Americans' good-natured acceptance of ads: "to be good-naturedly imposed upon is a positive pleasure, provided the cost of it is not too great." In other words, advertisign not only subsidizes entertainment; it is entertainment, and fosters a complimentary mind-set to that which entertainment proper fosters. People would be unpleasing to themselves without an ad world to identify themselves within. It's a ready-made imaginary for those who are too lazy or busy to spend the time developing their own. And it is a social imaginary that integrates one with his/her society. It's a means to feel at home and at peace with one's contemporaries and feel as though one can participate in the zeitgeist and know the terms by which one can secure social recognition. Defoe's Journal of the Plague Year documented a pivotal year for advertising, demonstrating how panic opens gateway to public susceptibility. The panic yielded early examples of quackery in print, and underscored the longstanding association between advertising and quackery, which sells the experience of being duped as a cure. 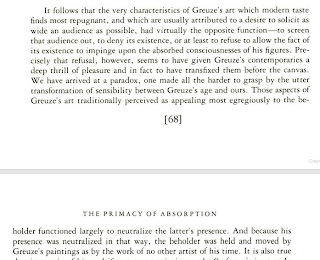 The process of being fooled, of suspending disbelief becomes the point, the experience justifies the product, which is nothing but an inert souvenir of how the ad kicked off an alchemical process within one's imagination. He notes Addison's Tatler No. 224 as an early survey of English advertising. As advertising grew as an industry, it became an increasingly reliable source of revenue as governments taxed them with stamp taxes. Worth noting that tobacco and snuff were basically patent medicines at the time, and advertised as such. Mass market not sought by advertisers until the early 19th century. He quotes Carlyle from Past and Present complaining about the inauthenticity problem with ads: that they allow manufacturers to focus their energy on convincing people of something that they could spend the same energy simply making it so. "The Quack has become God." Of course he had -- Turner alludes to the argument that consumer capitalism and advertising must follow from the industrial scale of production. A sufficient demand must be industrially manufactured to make it profitable to manufacture goods on the industrial scale. That is what modern media and advertising rest on. More early history of advertising: the Edinburgh Review in 1843. And Idler (1759); Quarterly Review (1855). Reading it on an iPad, which is stupid and I deserve all the inconvenience that causes, but it drove me to take some notes on the inside of a few matchbooks. 1. Money as honor, not as value measure. Money initially measures status; only later is it mobilized as a medium of exchange. It never attains the social neutrality we want to ascribe to it that would suit capitalism and its ideal of rational, frictionless exchange for everyone and for always. It remains a moral measure, a socially constructed means to express moral superiority. Chariot of the Gods? as metaphoric/mythic recasting of absurdity of economies organized around slaves digging up precious metals to give to soldiers to enslave more miners. What should society be organized to accomplish? Certainly not that, though in practice such a system may have evolved to permit the reproduction of hierarchies. Seems this is the function of debt, not the mobiization of productivity for some humane end. The shift Fried details below seems important, the fact that representations of reflexivity can become suddenly loaded and problematic for a society. The ability to let go of oneself can be reified and neutralized, circumscribed -- or it may be glamorized and disseminated as an ideal. 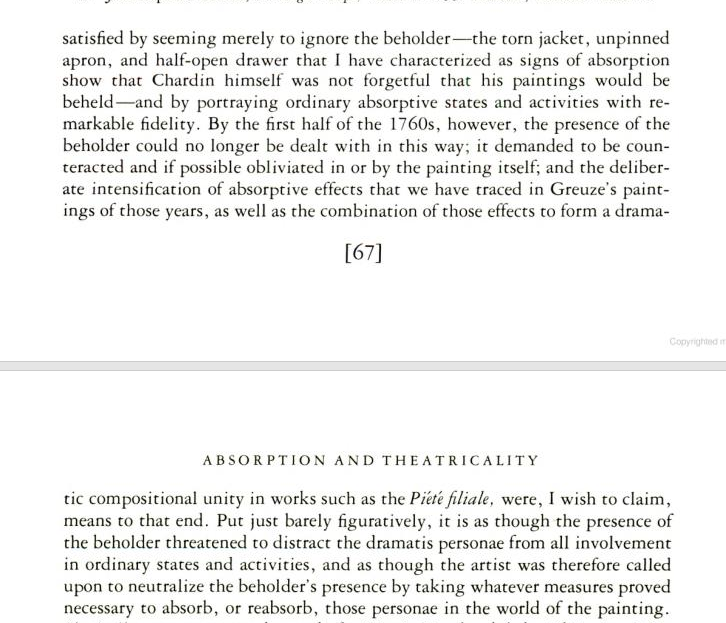 That absorption -- the antithesis of self-conscious reflexivity -- can itself become a self-conscious artistic trope that appealed deeply to critics like Diderot, who were so concerned about the corruption of spontaneous emotion, suggests something about our own era and the threats it poses to spontaneity. The escape from self-consciousness as long been an attractive fantasy, one that defies being represented without being turned into its opposite, strategic deployment of the signs of absorption. 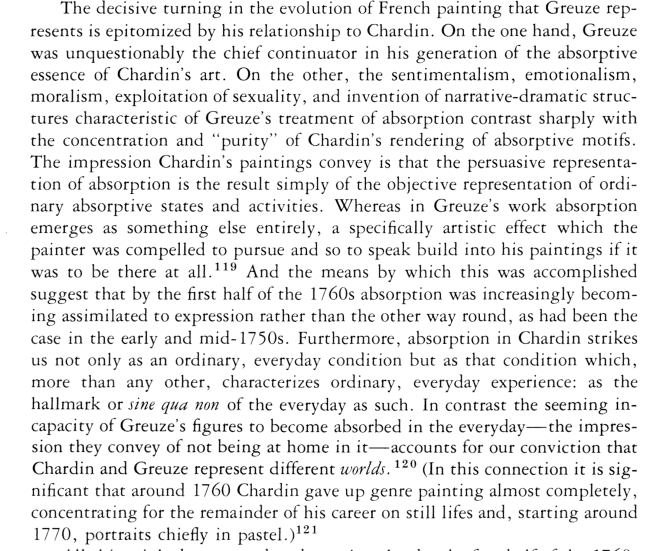 This is a small example of the larger 18th century concern with sensibility: how to represent emotions and display one's emotional sensitivity without invalidating the displays by being too calculating. The erosion of tradition -- the rise of social mobility -- made ritualized emotional displays suddenly suspect. They became a politicized point of class conflict between aristocrats and the rising bourgeoisie. Who exhibited "real" taste and feeling, and who was decadent or false? Certain stylized representations of absorption negate the distracting and disrupting presence of the ever-implied observer. 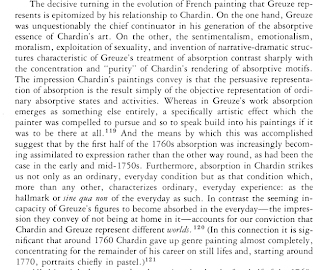 When Greuze's melodramatic paintings unfold before our eyes as if we are not there, the thrill is akin to confessional behavior in social media making us into voyeurs. This doesn't seem especially paradoxical to me. 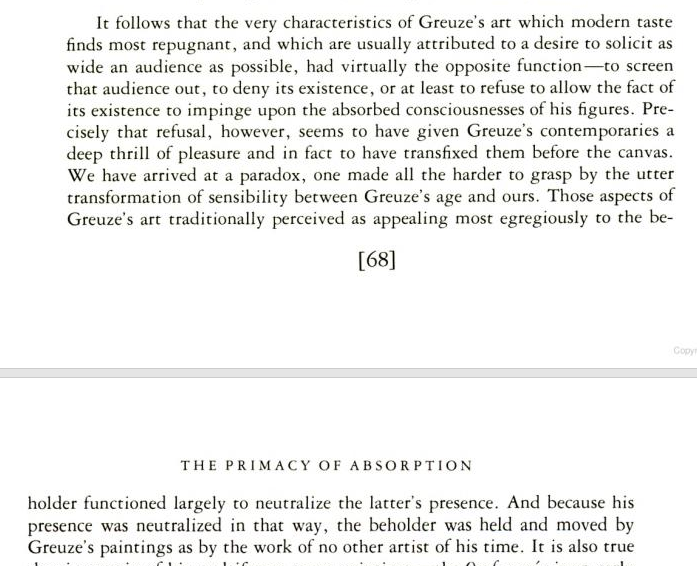 Our absorption in the confessional, absorbed behavior of others makes us simultaneously forget ourselves -- the painting effaces us so we can experience the bliss of self-forgetting.